Members of the Jamestown community are mourning the loss of local legend and kind spirit Jim McCusker, who died Friday at the age of 78. After a successful NFL career, McCusker, a native of Jamestown, returned home to open what is now a hometown gathering place. Football player turned restaurant owner, McCusker provided the area a friendly meeting place with excellent food. Aside from his business pursuits, family members said McCusker was a mentor and a friend to the community and beyond. A family business from the beginning, the loss was felt deeply on Saturday in The Pub. Lisciandro, who has worked in the family business for years and was very close with his uncle. “He was so genuine and fair,” Lisciandro said, adding that McCusker was very invested in Jamestown. “He loved Jamestown. That is why he came back, and he always believed in it.” He described a kind and honorable man who gave so much and ran his business well. McCusker was born and raised in Jamestown, attending Jamestown High school and played for the Red Raiders. He sported the jersey number 84 to great success. He then attended the University of Pittsburgh, where he also played the game. The NFL spotted his talent and shortly thereafter, he was drafted into the Chicago Cardinals in 1958. Throughout his years in the NFL, McCusker played for the Philadelphia Eagles and the Cleveland Browns. 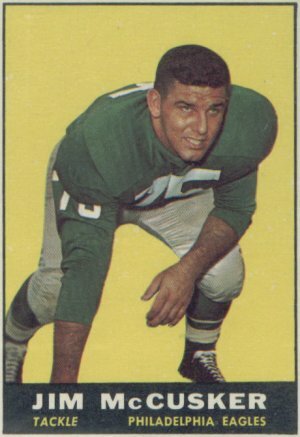 In 1964, he played for the AFL’s New York Jets. Ready to return to his old stomping grounds, McCusker returned home and opened up the Pub. The doors opened on Dec. 13, 1965 and the rest, as they say, is history. “He married my Aunt Mary her father owned the restaurant next door,” Lisciandro said. The couple married in 1975, and with his wife, McCusker built up the restaurant and served homestyle meals with a loving touch. Overall, Lisciandro said that his uncle was a great man in his business and with his family. “He was all around great,” he said as his eyes seemingly passed over the trove of memories imbued in the establishment.